The royal looking and mouth-watering Kaju Rolls are made primarily from premium quality cashew nuts, milk powder, and sugar. A single bite in these heavenly pieces would register a happy feeling in your mind. 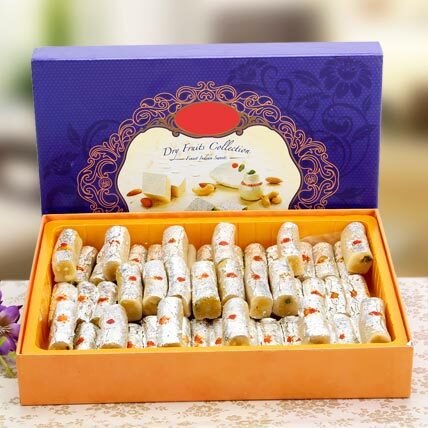 So, order this wonderful sweet box today and spread sweetness among your near and dear ones. Preferably, store all sweets in the refrigerator and warm them for 10 –20 seconds in a microwave before eating. Please consume the sweets within 2 days.